1. Diamonds are older than life on Earth, a true miracle of nature. 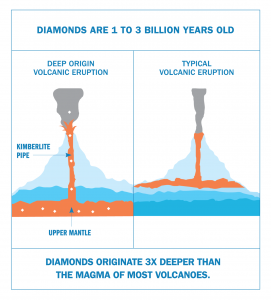 Long before there was life on Earth, there were diamonds. 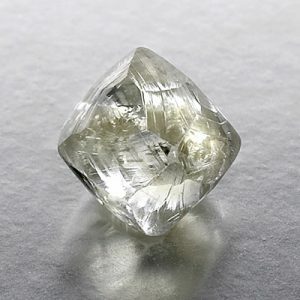 Most were created 1 billion to 3 billion years ago; the youngest diamond ever found is more than 100 million years old. Originating more than 100 miles beneath the Earth’s surface, they were pushed to the surface by volcanic eruptions 300 million-400 million years ago, long before dinosaurs roamed. Diamonds are the oldest thing that most of us will ever hold. 2. Diamonds are rare and getting rarer everyday. 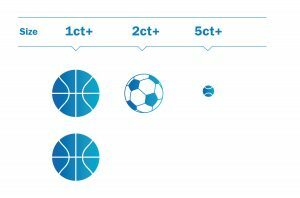 The volume corresponding to the annual production of diamonds 1 carat and up in size is equivalent to the volume of two basketballs. It is that of a soccer ball for diamonds 2 carats and up in size, and that of a tennis ball for diamonds 5 carats and up in size. 3. Demand for diamonds has never been stronger. 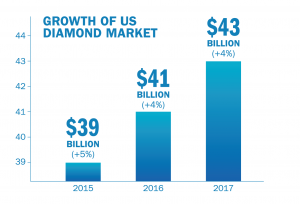 The strongest year ever for diamond jewelry in the world, including in the United States, was 2017. Millennials represent 59 percent of the value of diamond jewelry demand, while making up only one-quarter of the population. Research shows that millennials have a strong interest in products that offer authenticity, rarity, and preciousness–and a billion-year-old diamond is an ideal expression of authenticity in their lives and relationships. A real, natural diamond carries deep emotional meaning in a swipe-right world where things are increasingly fast and artificial. 59 percent of the value of diamond jewelry demand in 2017 was from millennial consumers. 4. Conflict diamonds are a thing of the past. Conflict diamonds, as depicted in the 2006 movie Blood Diamond,set in the 1990s, are largely a thing of the past. Since then, African rebellions have receded, and the industry has put in place strict controls (e.g. the Kimberley Process) to ensure that no diamonds coming from conflict-zones are traded. As a result, 99.8 percent of diamonds are Kimberley Process-compliant. Moreover, all major producers have safeguards in place to guarantee their diamonds are produced responsibly. 5. The diamond industry makes an important contribution to the world. The diamond sector supports the livelihood of 10 million people globally, including 1.5 million artisanal and small-scale miners and their families in Africa and South America, who provide 15% of the world’s diamonds and whose livelihoods depend on demand for diamonds. The discovery of diamonds in Botswana has transformed the country from one of the poorest in the world to a middle-income country. Today, every child there receives free schooling until the age of 13 thanks to diamond revenues that represent almost one-third of Botswana’s GDP. In the Indian state of Gujarat, the diamond sector employs about one million people and funds schools and hospitals. By any standard, diamond mining has a very small environmental footprint, and no chemicals are used to remove diamonds from the Earth. Mining companies are closely monitored by governments and local communities. Many operations are working on projects to move towards carbon-neutral status. The carbon footprint of a 1 carat polished, natural diamond is smaller than that of most CVD synthetic diamonds of similar size. 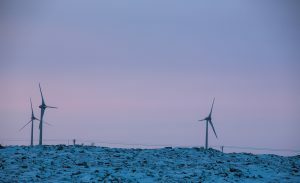 Close to 10 percent of the energy that powers the Diavik mine in Canada comes from its wind farm.